Marketers are all grappling with rapid change, but according to insurance and banking Suncorp Group's chief customer experience officer, Mark Reinke, it’s the customer-centric businesses that can operate more like digital platforms that will ultimately survive. “We are all grappling with change in customer behaviour, in technology, in regulatory and climate - at every single touch point,” he told attendees at CMO Momentum in Sydney. “But with that comes a hypothesis: As a large company, can we adapt and be resilient, or are we on a slippery slope to oblivion? In 1960, the average life span of a fortune 500 company was 60 years, but today it’s 16. Reinke anticipated that in five years’ time, it might be closer to 10. Reinke, who ranked number one in CMO’s top 50 in 2015, believes CMOs have to transform the business they’re operating in today. That requires technology, data and insight but most importantly, adaptability. “Now our board is very interested in this, and it should be the number one thing boards need to think about – how can we enable our organisation to be resilient to change and how can we adapt, particularly, if you’ve been in business for a long time,” he said. But in order to adapt to change, Reinke said marketers need to also shift the way they think away from traditional processes into a more agile and design patterned process. “I’ve been doing this for 25 years, and I’d love to say that it can be an advantage, but in reality it is a disadvantage, because while I think I am thinking differently, my pattern of thinking is actually everything I’ve already done,” he said. “That’s kind of scary. So one of the challenges we face - and I’m sure a lot of marketers do as well - is constraint of thought. Reinke stressed the bigger the organisation, the harder it is to implement change. The challenge with marketing leadership roles is you’re constantly balancing between investing for now and investing for later. “You’re constantly challenged to balance between investing and spending time for incremental change, versus quantum change,” he saidd. “On top of that, there’s the balancing act between investing in product development versus customer development – all of us have these trade-offs and it’s very easy to get caught in the polarities. If we just invest everything for tomorrow - guess what happens? You don’t grow your business, your shareholders get very cranky, and you’re out of the job. “But then if you only focus on today, guess what happens as well? You wake up in a couple of years’ time and you will not exist. So we’ve had to develop some techniques for managing that, otherwise we’d end up in the polarity, we end up doing nothing, or we just wheel spin. 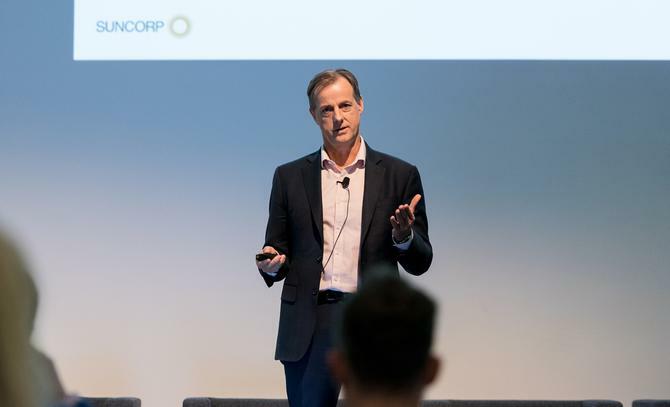 At Suncorp, Reinke revealed his team uses a framework called’ enhance, extend, renew’, which makes the company think about the right balance when it comes to improving the customer experience and moving the efficiency of the current business forward. According to Reinke, there is only one business model that is surviving at the moment and prospering and that is an ecosystem-based platform model, like AirBnB. In 2016, Suncorp revealed a new operating model and platform approach, which was centred around elevating customer needs and set to help the banking and insurance group keep hold of some of the 125,000 members who churn each month. The insurance giant’s efforts to re-architect its business away from vertical brands to a connected platform approach is about putting customers at the centre. “We were a value chain business, which meant we were good, but our products were commoditised and customers found value online in price,” Reinke said. “So if we didn’t start delivering new value for customers, we wouldn’t be able to survive. But moving from a traditional business to a platform is harder for established businesses, Reinke stressed, as it means you need to change your internal operating model. As a result, Suncorp had to rethink setting up a new platform based model around the customer, looking at customers want, designing the right experience, and offering the right solutions, Reinke said. “Then, we’ve got to create function, we’ve got to create banking stuff, and insurance stuff, and very importantly now, a whole range of things that we need to source globally for the future,” he added. “It’s not easy, we haven’t done it perfectly, but we’re all about creating value for customers and easy, useful, insightful and personalised experiences.